Discover the wonders of our new festive blend. The holiday season is here and what better way to celebrate than with our annual coffee tradition? Take a moment to savor this smooth, spicy coffee – first introduced in 1985 and back once again to make the season bright. The secret to this blend is the rare, aged Sumatran beans, which add a depth and mellowness to fine Latin American and Asia/Pacific coffees. So turn on the fireplace and get in the spirit –Starbucks® Holiday Blend is here. Keurig and K-Cup are trademarks of Keurig, Incorporated, used with permission. 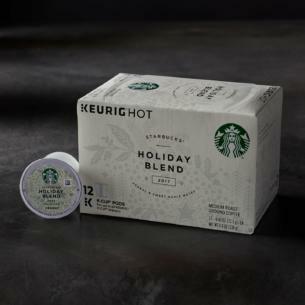 K-Cup® packs for use in Keurig® K-Cup® Brewing Systems.